During 2012 we at Soul Junction Records were fortunate to discover two excellent unissued Oliver Cheatham tracks “Don’t Pop The Question/Good Guys Don’t Make Good Lovers” (SJ518) and it was during the brokering of a subsequent licensing deal that we were introduced to the songs producer Mr. Bill Miller (who just happened to be Oliver’s cousin). During a later conversation Bill mentioned that he had some other unissued material on a group by the name of Elbowed-Out that he worked with while living in Seattle, Washington and would we be interested in hearing it ? Well, if it was anything near as good as the Cheatham tracks then you bet we would! Well it was and two well received 45 singles from Elbowed-Out would eventually be released, firstly the double sided dance 45 “Taking A Step” b/w “Girl You Got Magic” (SJ523) in 2013. Followed by a further dance track backed with a mid tempo ballad “Things Are Changing b/w Just To Be With You” SJ527 in 2014. A fifth Elbowed-Out track the sweet sounding “In The book Of Guinness” (probably the only song ever to reference the world famous record breakers annual in its lyric’s) also gained a release on the Soul Junction various artists compilation “We Got A Sweet Thing Going On” (SJCD5009) during 2014. So twelve months on we at last bring you the entire Elbowed-Out recordings from the group’s 1978/79 sessions with Bill Miller. Which include the aforementioned issued tracks, but on this occasion both “Taking A Step” and “Girl You Got Magic” appear for the very first time as their previously unissued full length versions ( with both being over five minutes in duration). Together with the remaining unissued tracks “All Men Don’t Love The Same”, “Believe It” and the album’s title track “Everybody Get Up” added to those is the recently discovered track “Girl I Want You” a solitary release recorded sometime during 1988 by Denis Wilcox with one of the groups later line ups. 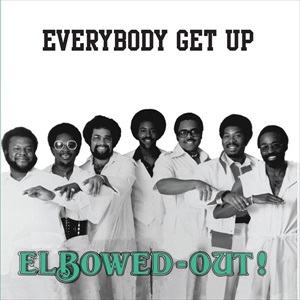 Elbowed-Out’s mission in life was “to get you up and out of your seat, and then to begin to move your feet” something I think you’ll agree they most certainly have achieved. So without further ado, just indulge yourself in the sound that is ‘Elbowed-out’.